Gasping during cardiac arrest was associated with improved neurologically intact survival independent of initial rhythm. The practical take-home is to avoid premature cessation of CPR if any signs of gasping or agonal respirations are present and to avoid suppression of spontaneous gasping during CPR. There are a few variables that either predict or modify the chance of neurologically intact survival, such as shockable rhythm, witnessed arrest, bystander CPR, etc. Along with ETCO2 and shockable rhythm, gasping is a newly identified marker with prognostic value. This is important for cardiac arrest researchers, but it also has importance when considering termination of resuscitation and pharmacologic suppression of the gasping reflex. This was a retrospective look at data that had been prospectively collected for a RCT, and gasping was a variable which was measured. Gasping (also known as agonal respirations) was observed in 10% of the patients in this cohort. They performed logistic regression to see if gasping was an independent predictor of prognosis in cardiac arrest. Neurologically intact survival was 20% in patients with spontaneous gasping vs only 3.4% in those who did not, adjusted odds ratio 3.94. This means almost 300% greater odds of survival than patients with no gasping. 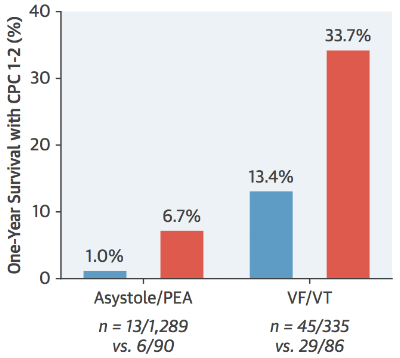 The other major variable associated with improved survival was a shockable rhythm. Combined with a shockable rhythm, gasping improved the odds ratio of neurologically intact survival to 57 compared with no gasping and no shockable rhythm. Long-Term Prognostic Value of Gasping During Out-of-Hospital Cardiac Arrest. J Am Coll Cardiol. 2017 Sep 19;70(12):1467-1476. doi: 10.1016/j.jacc.2017.07.782.